Like to fix system thread exception not handled windows 10 issue? Well, not a problem. I am here to help you by providing perfect solutions. As per the analysis, this is the common issue arisen on windows 8/10. And also this might occur anytime while the startup of windows or when you do any kind of random work. This can be unpredictable when it encounters and most of all the times occur at boot time respectively. 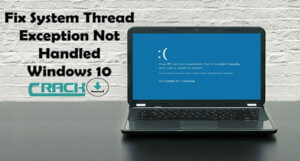 So let us finally going to solve the windows 10 system thread exception not handled the issue by performing these simple methods. And remember as all these methods will be well applied to all the users who actually get the BSOD at startup or appears unpredicted. Also, You should try these methods carefully so that can easily get rid of this stop code system thread exception not handled issue very well. Well, let me tell you, both the Windows 8 and 10 has inbuilt recovery mode. When you rush up to the startup issue at the time of boot of OS, will show up offering the options to fix the system causing system thread exception not handled windows 10. Most of all usually choose Bootable CD or USB for windows as that ultimately help the users to get same tools with a better convenience. In order to get recovery mode of windows 8 and 10, follow the below method undoubtedly. 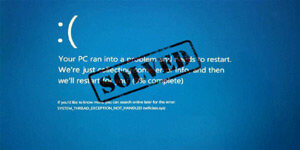 Once you get BSOD, simply lose PC through the power button and press continuously till it gets completely switch off. Do power ON and OFF it abruptly especially when the windows logo appears in the boot process. Repeat this for 3-4 times till the whole windows show the number of recovery options successfully. Now assuming you reached windows 8 or 10 options, go to troubleshoot-> advanced options until the window shows all the recovery options very well. Finally, Attempt to run the following command in it without any fail. This might help to find some errors. But make a note of this do not fix completely. Now run the following command finally too to fix system thread exception not handled windows 10 perfectly. Now simply close the command prompt and hence, reboot the system successfully. 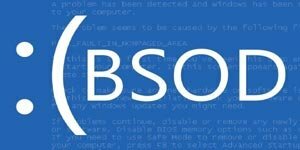 The first step, install the free application named as WhoCrashed and run the utility in order to find out the driver causing system thread not handled windows 10 BSOD error. Therefore, Make a note as the output of the utility must be similar as shown below. Well, if you check the file path, this definitely shows like whichatikmdag.sys is the troublesome driver for me. It can completely vary for most of the users. In case if you not in the position to run the utility, follow the below steps. Now you need to open the system in the safe mode. As soon as it gets turns ON, keep pressing F8 function key till the OS shows the menu of all the boot options. Once after successful login, where you see BSOD again and again, you will find the filename including system thread exception not handled. The output would be showcasing like system_thread_exception_not_handled windows 10 where this varies by the users. Note down the filename irrespective of location. Reboot and restart the system in order to get the recovery mode of windows 8 or 10. Navigate the troubleshoot-> advanced options-> Command Prompt. Run the following commands in command prompt. Where the filename is one you make a note in the above step. You can try the command shown below. Close the command prompt and Reboot it. So that you should boot it successfully. Therefore, Reinstall the updated driver that cause the trouble or everything working fine and leave it. All the Windows automatically take care of it. If in case you are not succeeded in reaching safe mode, you try this method that completely works. Turn it off. Remove the battery and unplug it from the power source and leave for few minutes. Hold down the power button for 5-10 seconds, plug power back in without the fail. And crosscheck so that must be back in BUT NOT THE BATTERY, turn on the laptop and start normally. Finally, Put the battery back at the earliest convenience. Once PC boots successfully, remove the driver which is causing both troubles and reboot it again without any fail. As a result, I hope you are cleared about the whole concept system thread exception not handled windows 10 provided in clear and understandable format. Also, if you like the article, share with friends and also on the social networking sites. Also, for any doubts or like to share your opinion, drop down in the below section. Thank you. Therefore, Stay in touch with cracko for more interesting stuff.